Farewell trusty HP 12c Financial Calculator! 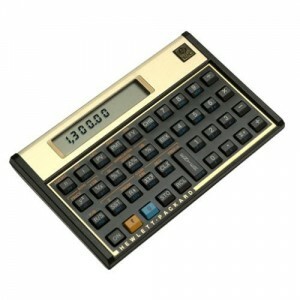 It’s time to say goodbye to one of the best things I picked up while getting my MBA… my HP 12c ABA financial calculator. (Sigh.) This is a great calculator… but silly enough, I later ended up picking up a second financial calculator (a Texas Instruments Financial Calculator) which cost less and was the one that my finance professor used in class. I tried to keep up using the HP, but he went so fast, it was hard to keep up on the keystrokes with the HP (you enter information into the HP differently than the TI). Anyway, I have no need for two financial calculators and since the TI is more practical for me, I’m listing my trusty HP12c on Amazon for sale. I used this calculator for two classes in business school and I got As in both classes! Thank you magic HP calculator! It works great and I’m going to miss it, but I have a second financial calculator that suits me slightly better. No defects or scratches, in like new condition. Comes with original pouch and the ever-important user guide/manual. Fast shipping! Farewell, my trusty HP 12c! May you serve another business student/professional well! UPDATE: It sold in less than 12 hours. The jozjozjoz.com archives for Sunday, September 14th, 2008.